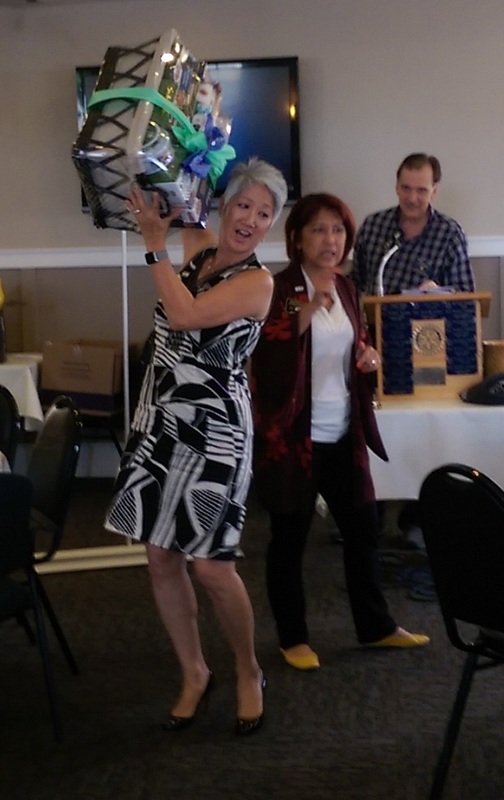 Harbor bought a great "DG gift" ...the Terra Linda club's basket. Of course, we set the bar high. The prior highest basket had been auctioned for $600 at Half Moon Bay. Our winning streak didn't last, though, because that night, our basket was sold at RCTL for fifteen dollars more...and then, not to be outdone, the RCME upped their basket bid to $1,200. As President Murphy exclaimed " I would hate to be the last Club the DG visits as it may get a little expensive . Well it is all good as the money goes to the Foundation and the winning Bidders get Paul Harris points." Pictured at right: Helen Abe dancing down the aisle with her prized basket! President Hugh Murphy is preparing our surprise gift for Jeri..a "living landscape" for her wall. Jim Carriere presented Shelter Box USA updates to our Club (a Shelterbox supporting Club). Rotary International has committed to another three year partnership agreement with Shelter box.